A very cute 'Both of You' Christmas card. 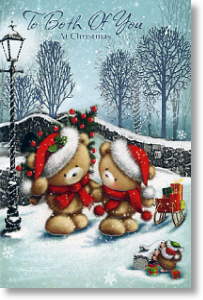 A teddybear couple stroll hand in hand through the snow, one has the Christmas tree ready to put up at home, the other a sledge full of Christmas gifts to go under the tree! A pair of hedgehogs look on. With everyone wearing Santa hats and the snow glistening with glitter detail this Christmas card has a truly festive feel! Front design is also embossed and has silver foil writing and detail making the scene look extra wintry and frosty.